How Long Do You Wait For Stragglers to Reach Your Shelter? 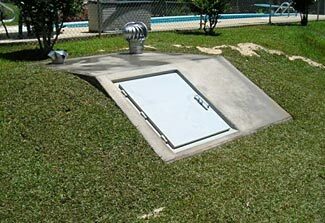 A nice shelter entrance, designed so blast waves will be partially deflected off the door. So you have invested in a blast/radiation shelter, and done all the necessary things to stock it and prepare for an emergency. And then, one day, an emergency truly occurs. You all (presumably) rush to the shelter, but inevitably, some of you get there before others of your group or family. How long do you keep the shelter door open, waiting for the slower and slowest people to get there? This is probably the most difficult consideration for you to grapple with. How long do you keep the shelter open (and thereby imperiling everyone already inside it) while you want for the slowest (or furthest away) members of your group to reach it? For example, what do you do if you have four family members in/around the house, and when the warning sounds, two of you are able to get to the shelter within 30 seconds, the third is somewhere that will take a minute, and the fourth is two minutes away. Do you wait the extra minute and a half for the fourth person to arrive, or do you shut and lock the shelter after the third person? For that matter, do you even wait for the third person? Another way of looking at it is should the three of you who have made it to the shelter now risk your safety by leaving the shelter open for the fourth person to join you? Remember, you have no way of knowing if there’ll be an explosion in your area in 5 seconds, 5 minutes, 5 hours, or maybe not at all. There are a couple of ways you could create a policy to cover this situation, and probably the first thing to do would be to understand the likely ‘worst case scenario’ times it would take people who are outside the house, but close to it, to get from where they are to the shelter. If our next article we talk about, amongst other things, creating a type of time/distance map so everyone knows how long it will take to get to the shelter from wherever they are when the alarm is sounded. This can also help people to understand, based on their location, if they will be able to get to the shelter or not. If they know in advance they are out of range, they can consider alternate temporary shelter arrangements and then go the rest of the way to the main shelter subsequently. The best approach to allowing stragglers to be admitted without risking the people who arrived in plenty of time is to consider an ‘airlock’ sort of design for the main entrance to your shelter. This will allow a person in through the outer-most door into an intermediate chamber. After they have closed the outer-most door, you open the inner door and allow them the rest of the way in. This would be a suitable solution that allows additional people in to your shelter safely, while not requiring the people who have already reached the shelter to compromise their own safety in the process. If you do this, we recommend you have some simple mechanical interlocks that will make it impossible for both doors to be open simultaneously. That way there can’t be any ‘cheating’ or mistakes that cause both doors to be open, risking everyone inside if a blast occurs during this vulnerable period. The ‘air lock’ section should be large enough for several people to easily be in it at a time, so as not to slow down the process too much for everyone. This type of approach will also be helpful when you start venturing out of the shelter during the period of time after the bombing has ended, but while you need to stay in the shelter for protection against dangerous nearby radioactivity. The ‘airlock’ design (with the two doors offset so that if both doors were open at the same time, it would not be possible to see from the shelter, through both doors, and to the outside) and augmented with a decontamination facility in the airlock passage would allow people to go in and out without allowing radiation or fallout contamination to enter. As a much less desirable alternative, and depending on the type of shelter design, maybe it is possible to quickly reopen and reclose the door again to let other people in – that way the door would only briefly open for a few seconds for another person or two to quickly come in, then the door would close again. If you have some baffles protecting the door so that, even if the door were fully open, there would be no direct radiation or heat path from a possible explosion point to inside your shelter, and the force of the blast wave would be dissipated, that would help reduce that risk, but of course, there’s a tremendous and potentially fatal difference, particularly if you’re within the radius of the initial fireball, as between having your door even slightly open and securely shut. Our preference and recommendation is for an ‘airlock’ type approach – this will also be useful when people venture out and return during any subsequent period of dangerous outside radioactivity. If you don’t end up with an ‘airlock’ type arrangement, then you need a policy for when the door will be shut and locked. Whatever you settle on, you first need to fully discuss and then mutually agree on it, and then, put it in writing so that there is no misunderstanding and everyone knows what to do and when to close the door. That way, there are no feelings of guilt or blame attached, either for people who get there in time or for those who might not. A formal policy also means that people who know they won’t be able to make it to the shelter will know that up front, and instead of wasting valuable time unsuccessfully getting to the shelter, can immediately work on whatever alternate option might exist. The first possible formal policy approach would be to say that you will wait for everyone to arrive. That’s for sure one approach, although it then ties the fate of all of you to the actions of the slowest of you, and also removes the pressure on the slowest person to be as ultimately fast as they can be, because they know you’ll wait for them. It is probably the worst policy to consider, so while we mention it, we don’t recommend it. A second policy would be to say that the first person to the shelter starts a timer with a pre-agreed upon time period. When the timer finishes, the shelter door closes, no matter who or how many of you are still out there. You could decide if that timer would be for 30 seconds, a minute, or however long you feel necessary. A related approach is for the activation of the alarm to also activate a timer, and when the alarm has been sounding for a specified time, as agreed in advance and shown on the timer, whoever is in the shelter will then close it, no matter who is not yet there. The third approach would be to say that if there are, eg, four of you in your group in total, then the shelter will stay open for so many seconds after the second or third of you arrive. A fourth approach would be, and let’s again say there are four of you, then you say that when the third person gets into the shelter, if the fourth person isn’t in sight of the shelter door and within a couple of seconds of entering, the door will shut. Of course, you can set a policy so it isn’t just the second to last person who triggers the conditional door closing, you could decide that ‘the majority rules’ and as soon as half your group have reached the shelter, then there is only a very few seconds before the door closes. There are many other ways you could agree on when the door will be closed. Our own preference would be to set a timer based on either from the start of the alarm signal or when the very first or second person arrives. If you wait until most of your group has arrived, there’s a danger that some people will say ‘don’t worry, we’ll wait for you, Bill, and with all three of us not yet there, they won’t close the door’. But if you make it so the first or second person activates the timer, and that the door should close at the end of that time period, no matter who or how many people remain outside, then there can’t be any ‘collusion’ and everyone will be headed as fast as they can to the shelter. One more thing. When the time to close the door is reached, you must then close the door, no matter if there is someone only seconds away. Because if you delay for that person, then maybe when they have got in, there will then be another person coming into view, also only seconds away. So you delay a second time, and now you’ve added however longer of risk with the door open to the entire group inside the shelter. When the time to close is reached, the door shuts, even if it slams shut in the face of someone within inches of reaching it. Your group also needs to understand that this is all about the survival of the fittest and the most committed, which will be the way of the new world. The person in charge of closing the door needs to give most priority to protecting the well-being of those people who did get to the shelter in the agreed upon time. It is not appropriate to risk the safety of all who did comply in the possibly futile hope of allowing non-compliant group members to get to the shelter too. We also urge you to use a timer, because that makes it an impersonal decision. As soon as the timer signals the end of the timing period, the door must be closed. It is no-one’s fault, and no individual’s personal mean-minded decision to close the door in the face of people rushing towards the shelter. It was a group decision to set the process the way it has been set, and a group responsibility to now honor the arrangement agreed. Your main shelter will be equipped for you to live there for a month, ideally for longer. But if you don’t have an airlock system to allow people to come in at any time, and if you have a significant probability that some people won’t be able to make it to the main shelter before you close and lock the entrance, perhaps you might need to consider a temporary shelter that would be suitable for protection from the initial blast effects only, and in which people could stay in briefly and then make their way the rest of the way to the main shelter as soon as it was safe. There will be a window of safety between when the bombs have stopped exploding and when the fallout starts to come down where there’ll be little radioactivity outside, making it safe for people to quickly move from a temporary shelter to the main shelter. That will only be for 30 minutes or so, however, so in such a case, we’d suggest timing from the first blast, waiting maybe 20 minutes or so (in case of additional bombs), then rushing from the temporary shelter to the main shelter. We recommend you design your shelter with an ‘airlock’ type entry so as to allow for people to safely enter the shelter even as a blast is occurring nearby. This avoids the ugly issue which you’d otherwise need to consider and plan for – what to do with stragglers when you’re all rushing to your shelter. If you don’t have this type of airlock, you need to agree that it is not fair that everyone else in your group is put at risk while the shelter remains open and vulnerable due to some people being slow to get to the shelter. You need to be prepared to close and lock the door after an agreed upon time period, no matter who remains outside.